Chock full of history, the Rotarian was launched as a proud product of the Sandusky, Ohio shipbuilding industry in 1889. A strong presence at 147 feet long and a beam of 27 feet, the Rotarian saw a number of years of service as a passenger ship. In the 1920’s it was moved to Chicago where it served a number of varied roles. These roles include; a dance hall, home of the Cook County Democrats, and a bootleg operation during prohibition. Even the notorious Al Capone entertained on board the Rotarian. 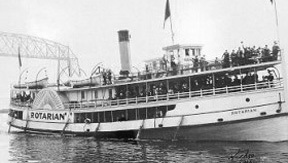 In 1931, the Rotarian sunk at its dock. It was then towed out to Lake Michigan and scuttled. She now rests in 84 feet of water and is the perfect wreck for the intermediate diver to explore. Be sure to check out the boiler, prop, and you may even see some prohibition era beer bottles lying around…but remember to look but don’t take! We visit the Rotarian from Hammond Marina.